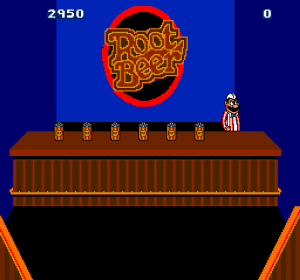 If you have an original arcade system, there is a tap you push down and up to serve a beer. You can move up and down in the conventional ways although diagonal moving is not permissible. Also, if you go down from the bottom or up from the top, your bartender scrolls around. This "hyperspace" is quite useful at times. If you are playing on an emulator or on a port, you will probably have to get the timing of pushing the button down and releasing. You can't do it quickly as the beer will only be partially poured, and the bartender will have nothing to sling. If you do it slowly, of course, you lose time, so you really need to get the timing down. I linger as fractionally as I consciously can before re-serving. If it is done right you can go pretty quickly and if you linger a bit longer you can serve more than four beers in a row to an aisle with four people-- perhaps very handy on later levels. So quickest is not always necessarily best. Moving up and down is not immediately responsive so you will have to give your bartender some leeway if he wishes to catch a beer at the last moment. Upon moving up or down you are placed by the keg where you can pour and serve a beer. This is useful because you can move towards the customers to pick up a beer and move up to serve another beer quickly. Specific examples of where this is nice include when two glasses seem determined to crash on the floor at once. Reach out to get one and hit up. You also return to the starting point in your aisle if you try to pour a beer--the beer goes floating down too. You can also pour a beer, move vertically, and then sling it down. This is useful if you realize you've made a mistake and there's no-one to serve; you can save time serving some other folks. One trick you can use at your peril is the sling "as-they're-about-to-finish." Depending on the rate the person starts to drink their beer, that's the rate they finish at, so you can sometimes sling them a beer right away to get rid of them. 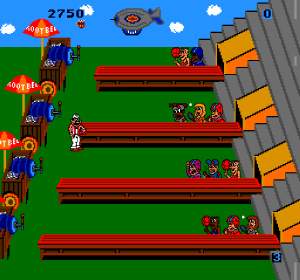 Misfire a bit, though, and you could sling a beer nowhere, losing a player. You get extra men at 20000 and then after each additional sum of sixty points. The level locations and design repeat every 13 levels. 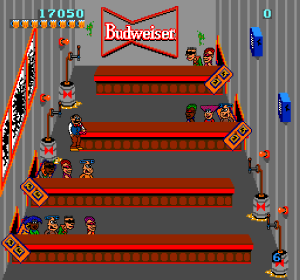 In fact, from level 14 on, the people repeat; however, for the first 13, you slowly get more people in the bar at one time. The customers approach you faster as you go through the levels. Below are the first thirteen levels and the designs. The designation "x----" means the patrons are on the left and "----x" means they are on the right. Of course the number is how many patrons there are. Certain patterns are clear, i.e. there is no formation with three kegs on one side. What you cannot see from the diagram is how the playing fields get more trapezoidal as the levels advance; 1-2 has equal sized bar aisles, but after 10-13 you see a pronounced centered set of aisles with each lower aisle being slightly longer than the upper. General stuff: people reappear faster and closer to you as the level drags on. They also seem to close in faster. So if you are able to finish quickly, great. That should be the object later in the levels. Also, as you go up in levels, the top levels seem to get smaller in width, meaning they are more imperative, although on the bright side people that appear there are easily knocked back. The dancing girls also may not be worth it unless there are a LOT of people in play. Often it is annoying to tell the people who have turned around from the people who haven't--if you sling beers at folks who have, you lose a man, of course. Level 1 & 2: These levels are good practice for clean beer-slinging and if you go pretty quickly you shouldn't have to serve any extra beers in level 1. 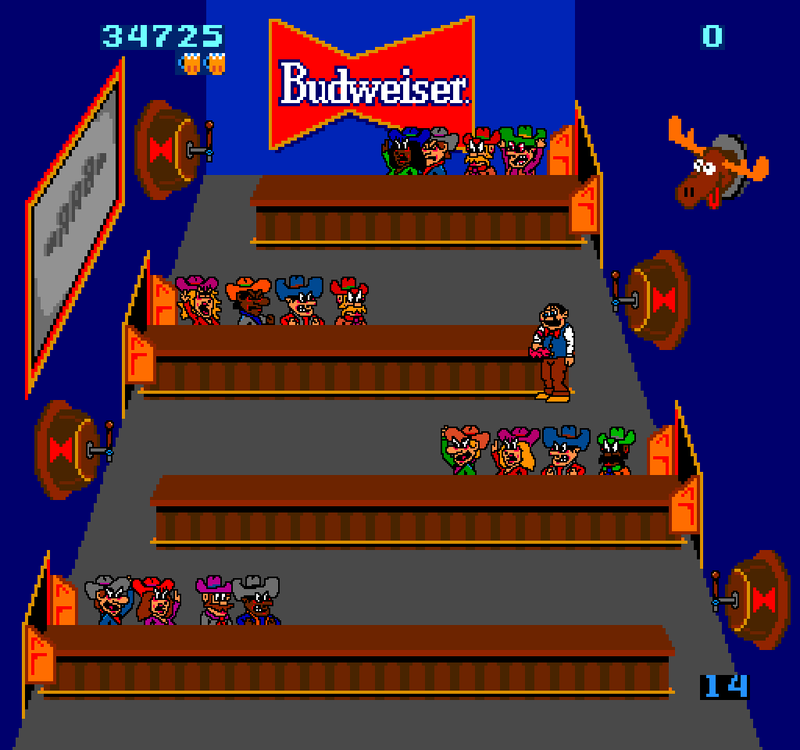 In level 2 you will probably need to serve extra beers on the bottom row. You're more likely to get a tip there, though, in case you want to see the saloon girls dance. Level 3-5: The next three levels are a bit tougher. Fortunately you can finish them off quicker. In general I prefer to sling as many beers as I can, move down, etc. until I am back where I started. Then I need to "multi-task" picking up beers and serving them although it is not too bad--nothing's too fast. After slinging beers to the top row, you may want to go up and take care of the third and fourth rows again. Levels 6-9: Follow the same sort of regimen although you will really need to get the sling-four routine down as most rows will by now have four patrons. 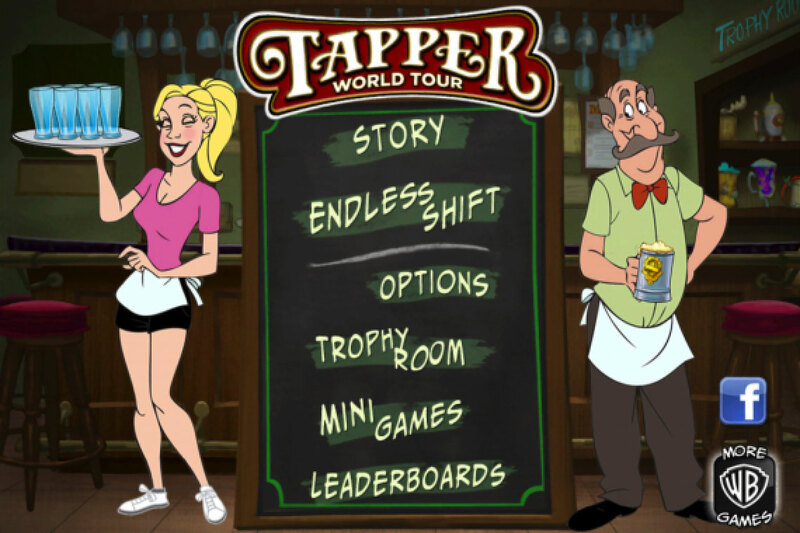 Multitasking becomes more important here, and you'll have to pick up a lot of beers and immediately serve and move up and down and learn how to combine moves. Only go to the top when there seems to be an emergency there and the bottom customers aren't taken care of. Only pick up tips from the top. Levels 10-13: These levels are much the same as 6-9. If you don't have precise pouring skills nailed down here, you are history as a bartender. Sorry for the cop-out but read the general information below for advice. 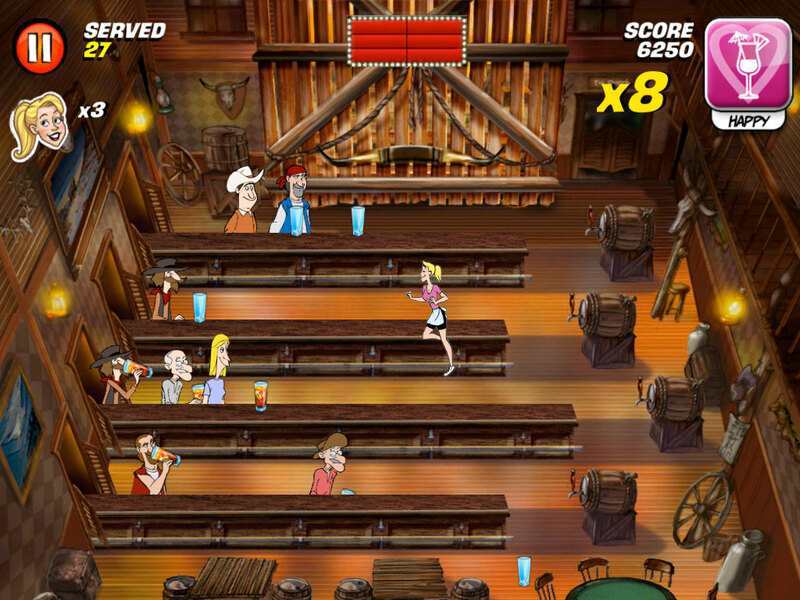 Bonus rounds appear after you have cleared all of one type of bar (like the saloon, outside sports bar, punk bar or alien bar). The closest thing to evil in this game appears to the left. 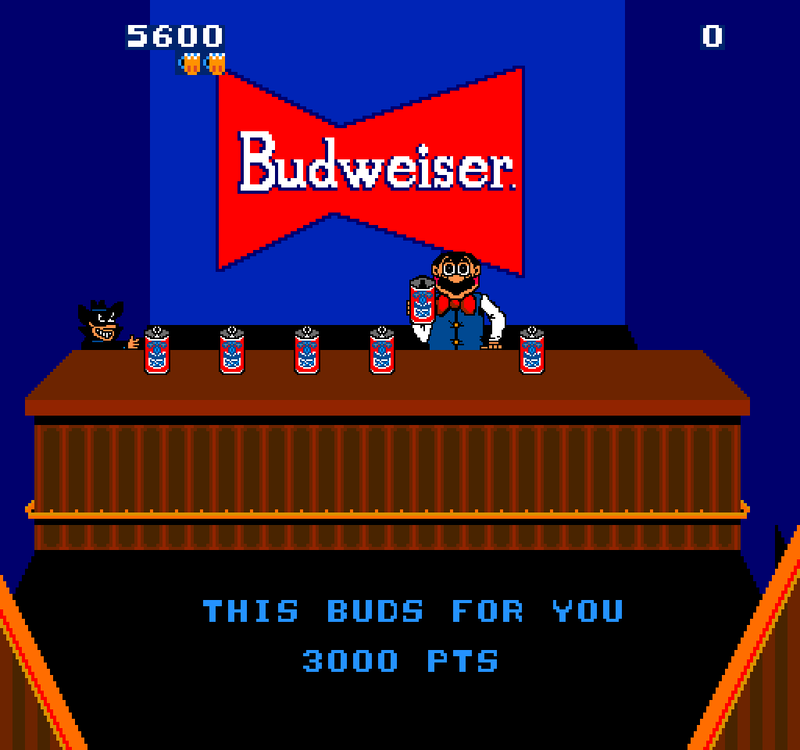 With your bartender's back turned, the masked figure shakes up five of the six cans in the center. 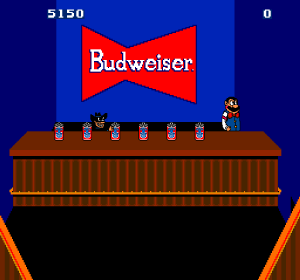 He then bangs the table and the cans start moving around. If you focus on your can you should be able to figure out where it winds up, but a moment of distraction and you will lose your place. 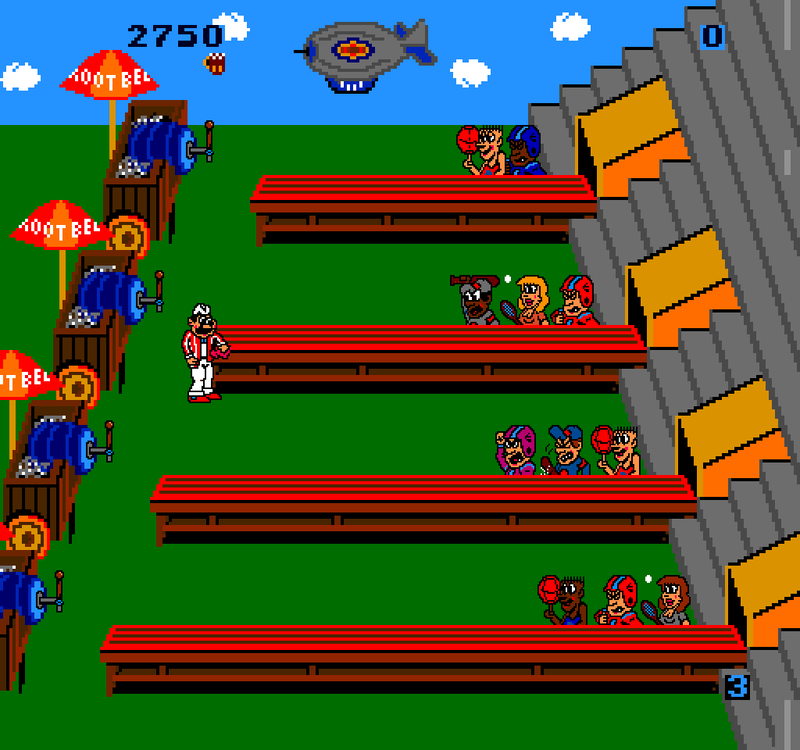 The cans get faster until level 9, when you have to pay close attention indeed. 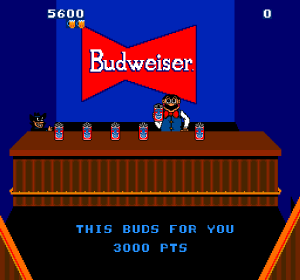 Success gets you 3000 and a "This Bud's For You." Failure gets your bartender a shower of fizz and a defeated look with an impromptu new hair style. 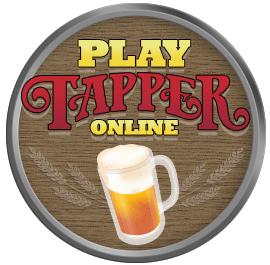 Play Tapper online in your browser window! Select a clone below! There are two common versions of this game -- one with Budweiser beer and another with root beer. 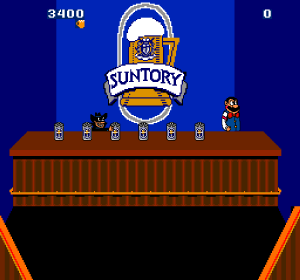 In the late 1990s, a couple of boards made by SEGA featuring the Suntory logo were discovered. Sega denies they ever produced the board and it is not listed in any of their databases. The Suntory Tapper board is a complete re-engineering of the MCR/III hardware. 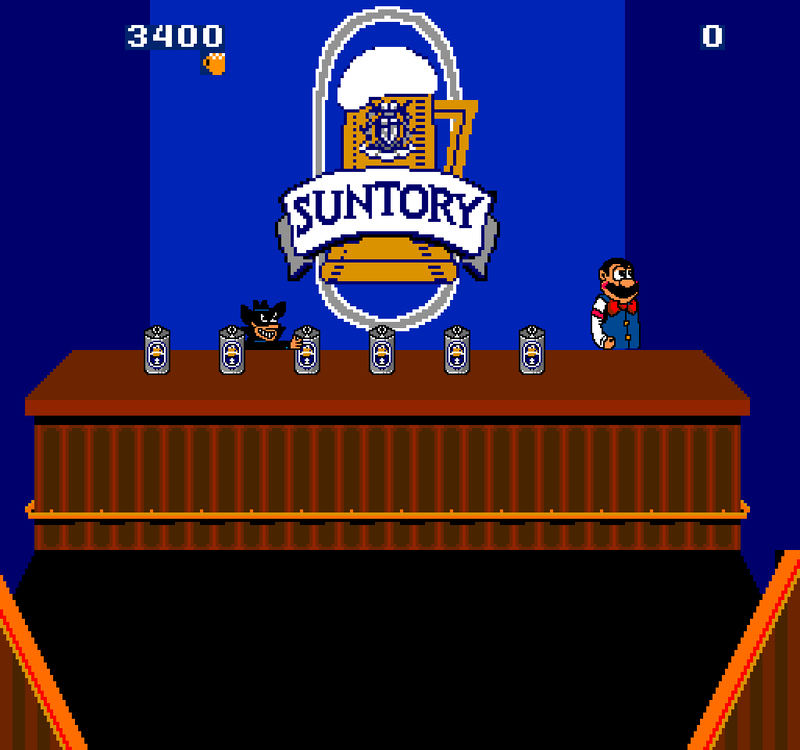 Suntory is a defunct brand of Japanese beer. Around 3300 Tapper uprights were made and maybe the first 100 or so were released with color side art. About 300 cocktail machines were also made. 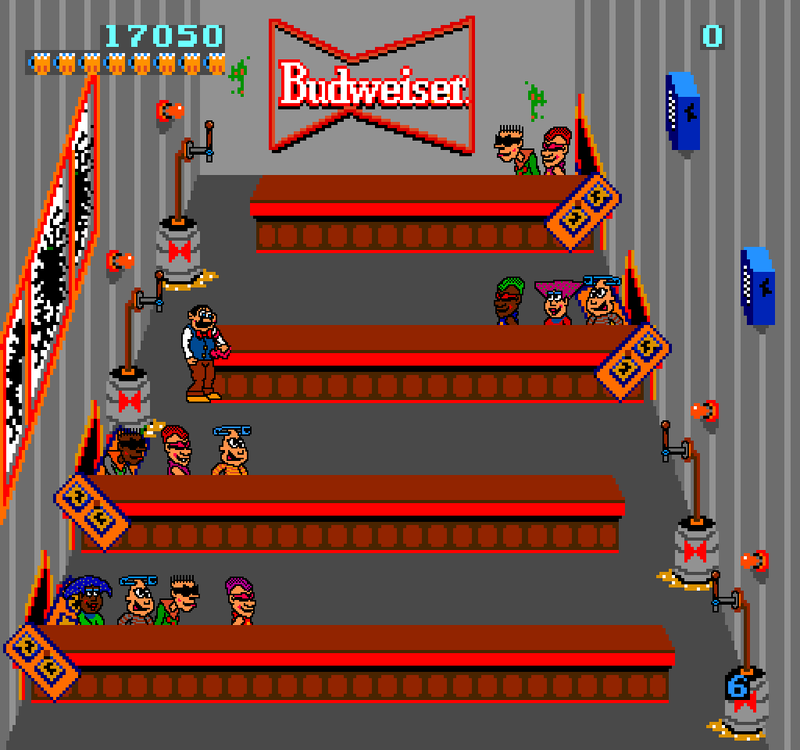 According to programmer Scott Morrison, sometime during the development of the game, the programmers thought it would be fun to hear belching in the game to correspond with the belching action of some of the customers as they finished their drinks. The design team got a speech chip from Texas Instruments, and they took turns belching into a microphone to create a chip full of their own belches to be used in the game. However, although this feature was very funny to the programmers, Scott Morrison says that it got obnoxious after a while, and they scrapped the chip, figuring that the rest of the audience would feel the same way. 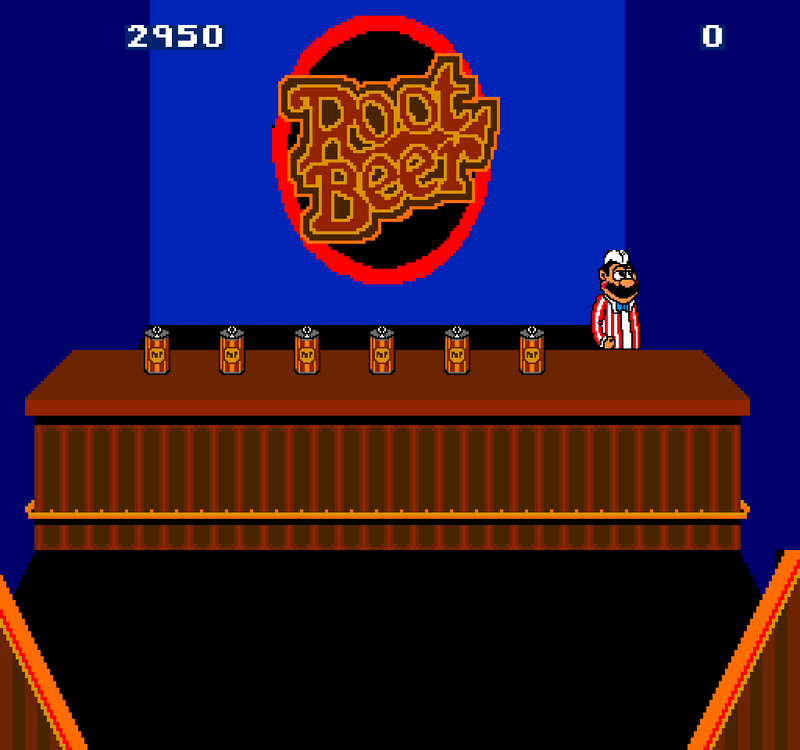 On the original arcade, holding down the joystick and both tappers and pressing both start buttons on the title screen will reveal a credits screen in both Tapper and Root Beer Tapper.